Make Utah History Fun » Archive » Bomb Drill! Your students have experienced fire and earthquake drills, but have they ever experienced a bomb drill? This was something that they’ve never had to fear like you (if you’re old enough) or your parents did. But bomb drills were not uncommon during the Cold War. Here are three activities that can help your students understand the dangerous reality of the Cold War. Feel free to do all of them! After explaining what the Cold War was, show your students the video below which was created by the U.S. Civil Defense branch for children across the country. Many schools and other public facilities acted as fallout shelters, just in case there was ever a nuclear bomb threat from the Soviet Union. 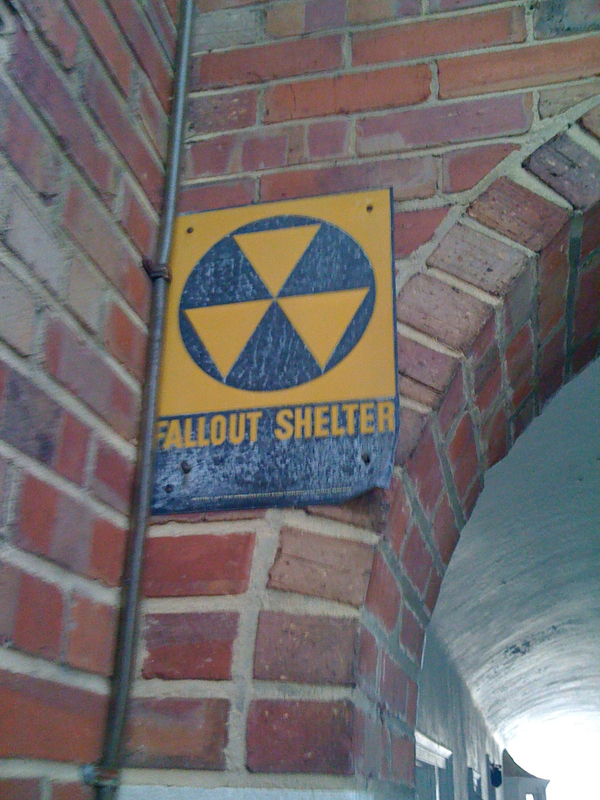 If your school is old enough, you may just be surprised to an old yellow sign posted on the building that says “Fallout Shelter” with the nuclear symbol on it. 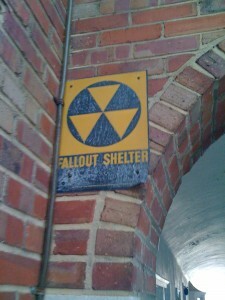 You can still see signs around town that post locations of fallout shelters. Have you seen any around your neighborhood? Your students may have seen them. They may also have seen civil defense sirens around town (which can vary in design- one example is in the video in the link below*). It’s finally time to explain to your students what these signs and sirens are all about! In this activity, students react the same way they would during an earthquake drill- hiding under their desks, facing away from the windows, and covering their heads with their arms. -On a projector, show your students the video of the siren posted below. Be sure to turn it up! 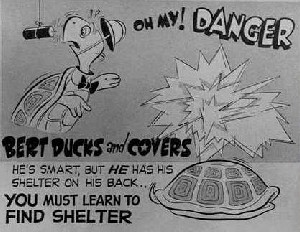 -Students are to immediately “duck and cover” for protection from any potential bomb. If you can find one around your school, take your students on a quick “walk-able” field trip and show this this amazing primary source they’ve been walking past every day! While on the walk, or standing in front of the sign, explain how anyone from the community could use the fallout shelter, not just students. Also explain the disastrous effects of a nuclear bomb. Unfortunately, the threat of bombs was very prevalent and feared during the Cold War. But just as equally feared was the radiation that lingered in the aftermath, even from testing sites. The nuclear bombs tested in Nevada and Northern Arizona left clouds of radiation over Southern Utah. One bomb named “Dirty Harry” was just one example, and it left a radiation cloud over St. George for over two hours. This was common from 1951-1958. Back then, scientists didn’t know as much as they do now about radiation poisoning and how could potentially cause cancer. In Southern Utah, as well as other places affected by radiation debris, there was an increase in people diagnosed with cancer. *There was (still is?) a siren just like this one in the school yard of Westmore Elementary in Orem. Growing up I always wondered what the heck it was! Now your students can know, too!